It's been awhile since I shared a recipe. This is one I've made for about two years now. If I remember correctly, it was inspired by some mini barbeque chicken pizzas on Pinterest, but I changed it up a bit! As is many of the meals I make, this one is super simple! Enjoy! *To cook my chicken, I bake it at 350 for about 1 hour. I usually add some Italian dressing to keep it from drying out. Once cooled, I shred it in my Kitchenaide Food Chopper and store it in the refrigerator (or freezer) until I'm ready to use! 1. Make dough according to package instructions. I always bake for about 5 to 8 minutes before adding the toppings. I think it makes the pizza less soggy. 2. Mix BBQ sauce and ketchup. 3. 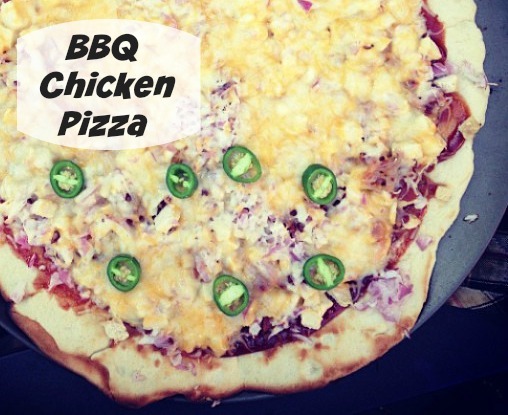 Spread bbq/ketchup combo on half-baked pizza dough and top with chicken, bacon, onion, cheese, and jalapenos. 4. Bake for about 8 more minutes (or according to package instructions) until crust is light brown and cheese is melted. YUM! I'm going to have to try this! We always make the same boring old pizza and I've never even thought to make my own BBQ chicken pizza!